We are pleased to offer an extensive assortment of Mills to suit any budget and décor. Launched in 2011, we now proudly offer a complete range of Mills, in a variety of finishes and with a variety of mechanisms – we truly have a Mill to suit every need! 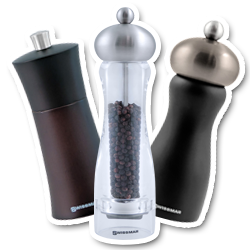 Swissmar Mills feature a variety of mechanisms, from the German-Made 'workhorse' a case-hardened steel pepper mechanism with consistent output from fine to coarse, to versatile ceramic mechanisms that can be used for pepper, salt and even dry herbs and spices. The Connoisseur Collection breathes inspiration into every meal and encourages the release of your inner chef! The Connoisseur Collection features mills in wood and in acrylic, aptly named in honour of their German heritage. Wood mills have a unique technology called HELICOIL® that deters the adjustment knob from coming loose ensuring the grind setting does not change during use. Each mill is crafted with precision and care and carries a lifetime warranty on the mechanism. 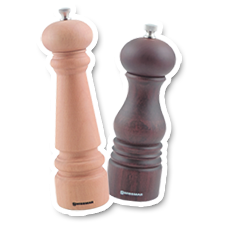 Iconic would be the perfect way to describe the profile of the new Castell and Manor pepper and salt mills. Often regarded as a status symbol, these classically designed mills are turned from quality European beech wood and look great with all types of décor. It's in the details! EZfill™ ring for easy filling. The distinctive red mechanism casing makes a statement, identifying these mills as unmistakably Swissmar! 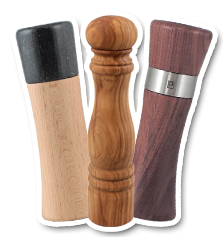 Featuring exotic woods like Italian Olive Wood, American Walnut, North American Cherry Wood, each crafted from a single piece of genuine wood, this mill collection is truly exquisite. 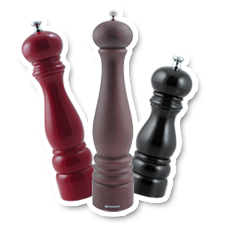 Mills feature a multi-purpose ceramic mechanism that is suitable for pepper, salt and dry herbs. Adjusting the grind of the ceramic mechanism is done at the base of the mill with a simple rotation of the adjustment ring. Swissmar Mills Classic Collection features an assortment of Mill styles that are sure to suit any décor. The ceramic multi-purpose mechanism is suitable for pepper, salt and dry herbs and is easily adjusted with a simple turn of the knob, from coarse to fine with a twist. Choose from a variety of materials and finishes; wood in natural, chocolate, red lacquer, black lacquer and black matte finish; acrylic in clear, red, white and black finish; brushed stainless steel; and natural polished granite. The smartest mill you will ever need. 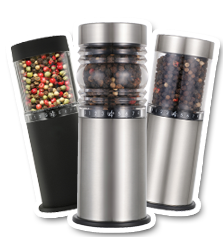 Both smart and stylish with unique features: Multi-purpose mill - Suitable for salt, pepper, dry herbs and other spices. While twisting to grind, the base opens automatically to dispense ground spice. When not in use, base automatically closes to keep tabletop free of spill. With a grind adjust indicator, it offers 7 grind levels from fine to coarse. High output performance mill. Easy to fill. Beautifully designed black matte mills with brushed stainless steel tops add elegance and style to any table top.